The African Grasslands exhibit was recently honored with the #2 spot on USA Today's 10Best Reader's Choice list of the Best Zoo Exhibits in North America! See the full list of winners. The African Grasslands spans 28 acres and is the largest project undertaken in the Zoo's history. It has transformed the eastern boundary of the Zoo, from the former Grevy's zebra exhibit up to Pachyderm Hill, once home to African elephants and white and Indian rhinos. This area winds visitors through a rocky outcropping called a kopje, which is indicative of the African landscape. Animals in this area include meerkat, klipspringer, hyrax, Kenya crested Guinea fowl and white-throated monitors. The hyrax and klipspringer display features heated rocks for the animals. 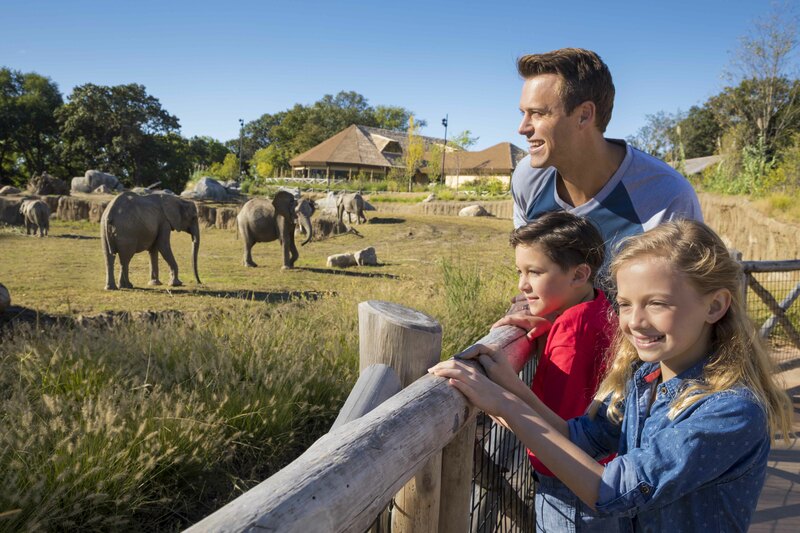 A viewing pavilion offers incredible long views of the giraffe and white rhino exhibit. Outdoors, giraffe roam with impala, white rhino, ostrich and spur-winged geese. Inside, hay-feeding nets and automated food dispensers have been installed along the perimeter to allow for 24-hour enrichment. Animal health equipment has been built into the facility to help animal care staff perform any needed veterinary procedures. The Syd and Betty Cate Giraffe Herd Rooms is currently closed. Opens daily beginning May 12. The elephant exhibit measures more than 29,000-square feet and is the largest herd room in North America. The outdoor area will be a mixed-species exhibit, which includes elephants, plains zebra and impala. The indoor space features a soft floor with three feet of sand. Enrichment is offered around the clock for the elephants including: hay baskets on a timer that drop from the ceiling and fall within reach throughout the night and an enrichment wall with cubbies that open with treats inside, also on a timer. There is a 150,000-gallon filtered pool that ranges from two-inches to five-feet deep, sand and soil substrate, mud wallows, terrain changes, behavioral training demonstrations and an artificial fallen log and timed feeders to encourage exercise and full use of the exhibit. Located in the center of African Grasslands, the African Lodge serves as a hub for Zoo visitors. Tusker Grill s a concession area that offers indoor and outdoor seating for 300 guests overlooking the elephant exhibit and wading pool. This facility, features a thatched roof and is available for private functions, as well as overnight campouts. The African Lodge opened to the public in summer 2015. The African-themed Kenefick Train station is adjacent to the African Lodge. There is a themed ticket booth next to the train station. This interactive exhibit gives Zoo visitors a chance to play with and brush African pygmy goats. This area provides viewing of the giraffe and rhino exhibit. Archie is a life-sized bronzed replica of an ancient Nebraska Columbian mammoth. The sculpture provides a unique connection to its African counterparts, elephants. Mammoths once roamed the Nebraska landscape 10,000 years ago. The life-sized, 14-foot-high mammoth sculpture was created by award-winning Nebraska artist, Gary Staab, who has worked on projects across the nation. New species in the Lagoon include African pink-backed pelicans and white-faced whistling ducks are the highlights of Pelican Lake and Bridge near the Lagoon. A sea wall has been added to protect the bank from erosion and a new bridge has been installed to allow Zoo visitors access from one end of the lagoon to the other. Pelican Lake and Bridge offer guests excellent viewing of the elephants. This exhibit has two heated rocks for the cheetahs and is situated to give the cheetah a great view of Lagoon Valley. Inside, they have mulch floors, a softer substrate. The cheetah exhibit can be seen from Wildlife Management Headquarters. The lion viewing area offers close views of the lions. A large exhibit featuring a tall rock formation gives lions the opportunity to view the entire African Grasslands. Also, a Land Rover, cut in half, is situated on both sides of the glass for the lions and guests to share. The indoor viewing area has a heated rock inside and out of the viewing area for both lions and guests. A lion training area features guest seating and an area for keeper demonstrations. This area provides groups and families the opportunity to stay overnight in tents adjacent to the lion exhibit. This is the first time there will be safari-like outdoor camping at the Zoo. The tents are rainproof, on deck platforms and each tent has electricity. There is a sink for campers and a campfire for roasting marshmallows. Overnight experiences will include a night hike and morning hike led by Zoo staff. Click here for more information about staying the night in the area. This area provides an area of exploration. Guests can take a look at what tools wildlife managers use in the field. There is an actual lion shipping crate and elephant crate that one of our elephants traveled in on. There is also a real grounded Bell 47 helicopter that guests can sit in. A Land Rover in which kids can climb in can also be found in the Wildlife Management Headquarters, which is exactly the type of vehicle you would sit in on an African safari. Ranger Camp Snacks is an African-themed food truck for guests to find a place to eat. There are also restrooms available in this area, including a family restroom. Guests can view Sable antelope from the Wildlife Management Headquarters. A sunken barrier gives Zoo guests an eye-to-eye experience with the animals. Their inside holding area has mulch floors to allow a softer substrate and bedding. The Bongo can first be seen as you make your way up the hill and then from several vantage points along the path that feature hidden barriers. Like sable, these animals have a soft floor in their night quarters.